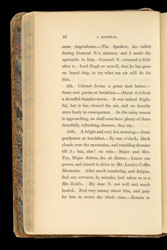 Extract from Lady Maria Nugent's journal. Maria was the wife of George Nugent, the Governor of Jamaica from 1801-1806. Her journal provides information about life in Jamaica, from its oppressive heat to details of the social engagements enjoyed by the ruling elite. In this extract she recalls the deaths of Mr Sandford and Lord Hugh Seymour, and describes the work of the enslaved people of the Pepine and Hope Estates.